Colin's Suite in the sun-filled Onze Rust wing, has a king size bed, exquisite furnishings & leads into a private garden. Full en-suite bathroom. Double/ twin/ single occupancy. Courtesy fridge, complimentary Wi-Fi, Hotel Package DSTV & air-conditioned. Luxury accommodation set amid lush gardens and ancient trees. Foxwood House has everything to make your business visit to Johannesburg a pleasure: a tranquil setting, excellent cuisine and friendly service. Foxwood House has five-star status, and is registered as a guest-house as it is situated in a quiet residential area, but our facilities conform to all requirements for full hotel status: room service, a liquor license and all meals expertly prepared by our chef, Jean-Louis du Toit. Complimentary on-site parking and 24/7 security services. Laundry service is available. Foxwood House contains several smaller venues suitable for intimate business meetings, as well as larger venues for conferencing. Foxwood House has a theatre. This is housed in a quaint stone building, nestled serenely under a canopy of trees outside the Historic Villa. This tranquil setting totally belies its ongoing activity. Foxwood Theatre hosts many great shows and musicals over weekends. Foxwood House is centrally situated in an exclusive area, 2 kilometers (1½ miles) from Wanderers Cricket Stadium, 4 kilometers from Ellis Park Stadium, in the same street as Killarney Golf Club and near to the Houghton Golf Club. We are close to shopping malls and restaurants and within easy reach of the popular, up-market night spot, Melrose Arch. Foxwood House is easily accessible to all the major arterial roads and freeways. The historic villa an historic old home dating back to the late 1920's is today part of the complex of buildings called Foxwood House. 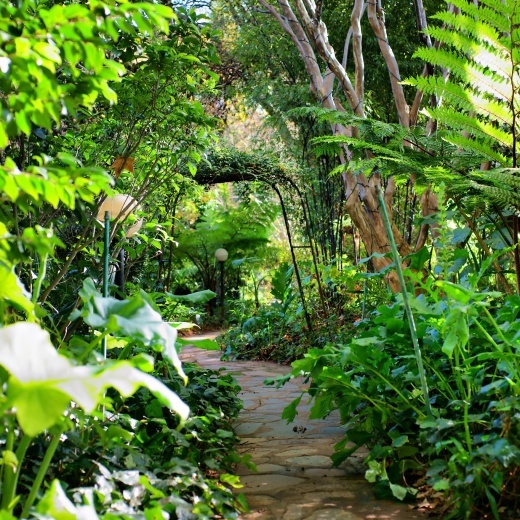 The Villa was designed by renowned Johannesburg architect, Frank Flemming, a partner of Sir Herbert Baker. Baker was strongly influenced by the designs of ancient farmhouses in the South of England, where he was born, and of course, by Cape Dutch architecture. 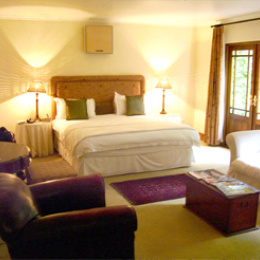 We have 12 luxury suites on our premises ranging from the charming Stables Suites to multi-roomed Suites. Most guest suites have private entrance with access to private patio / garden areas. All have luxurious period furnishings and are fully air-conditioned with complimentary Wi-Fi, telephone, wide screen TV with the full DSTV bouquet and undercounter fridge. In the event of premature departure the full extent of the stay as originally booked and confirmed will be charged. The following cancellation charges will apply should a cancellation or postponement occur. Cancellation within 7 days of date of arrival, 50% of FULL accommodation is payable. NOTE: Foreign credit card holders kindly ensure that your credit card is programmed for manual and electronic processing.